Designs of T-Works, a hardware incubator being developed on the lines of T-Hub, have received final approval. The first phase of works will be completed as per the design by June this year. Further, a team comprising officials and experts will conduct a study for setting up the T-Cloud by visiting the States and countries which are already implementing such programmes. 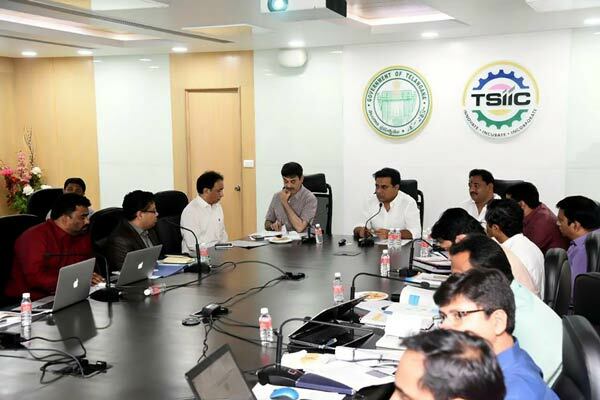 IT and Industries Minister KT Rama Rao on Tuesday directed officials to expedite works of T-Fibre grid and complete works of Technology Demonstration Network (TDN) being established in four villages of Maheshwaram mandal. Principal Secretary for IT and Industries Jayesh Ranjan has been asked to conduct a field visit and examine functioning of the TDN. Using T-Fibre grid, the TDN will be ready within two weeks for demonstrating technology services including e-health, e-governance, internet and cable television services among others. Officials are considering to showcase the TDN during the forthcoming World Congress IT and NASSCOM India Leadership Forum from February 19 to 22. Reviewing status of various projects taken up by IT and Industries departments at the office of Telangana State Industrial Infrastructure Corporation (TSIIC) here, the Minister inquired about the progress of TSIIC projects especially Kakatiya Mega Textile Park at Warangal. He wanted the officials to work in coordination with the companies which were allotted land in the textile park. Officials informed that following environmental clearance, infrastructure development has been taken up in the textile park. A water supply facility is being developed at a cost of Rs. 50 crore, while requests were made to revenue department to allot 20 acres for establishment of government offices adjacent to the textile park. The Minister discussed the possibility of establishing more dry ports in the State. Nine companies were sanctioned permissions for establishing their units in the Medical Devices Park, while works picked up pace at Green Industrial MSME Park at Dandu Malkapuram, proposed National Investment and Manufacturing Zone (NIMZ) at Zaheerabad, mega food parks and seed parks coming up in the State. Principal Secretary for IT and Industries Jayesh Ranjan, TSIIC Managing Director EV Narasimha Reddy, T-Fibre Managing Director Sujai Karampuri, and other officials were present.